Sports Direct was founded in 1982 by Mike Ashley and has grown to be one of the biggest sportswear retailers in Europe, having bought out groups including Lillywhites, USC along the way to trade out of almost 700 stores in 25 countries. It also owns a lot of key sporting brands including Lonsdale, Slazenger and Dunlop. The group has invested heavily in its stores in the last few years, transforming many of them from discount format stores to brighter, organised stores carrying a much wider range of top brands like Adidas, New Balance, Puma and Nike. Where can I check my Sports Direct gift card balance? You can check the balance of a Sportsdirect card at any of their stores. Check here for your nearest Sports Direct store – you can also find the phone number of your nearest store here. You can call Sports Direct for customer services on 0843 850 2455. An online balance check for the Sports Direct giftcard is not yet available on the Sports Direct website. We will update our pages if this changes though! Where can I buy a Sports Direct gift card? 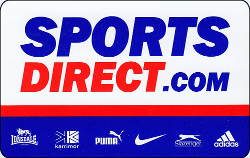 Sports Direct gift cards are available in all Sports Direct stores in the UK. Sports Direct gift cards are not available directly from the Sports Direct website, but are available in denominations of £10, £20 and £30 from HighStreetVouchers. Minimum order is £20. If you order between £30 and £100 then first class postage is free. Where can I spend Sports Direct gift cards? You can spend your Sports Direct giftcard at any Sportsdirect UK store. The gift card cannot be used in Sports Direct stores in Europe. The gift card can also be redeemed on the Sports Direct website, sportsdirect.com, lillywhites.com, fieldandtrek.com, soccerscene.co.uk and dragoncarpdirect.com. As of 2016, Sports Direct is rapidly opening new stores across the UK. Click here to find your nearest Sports Direct group store. Sports Direct giftcard redemption conditions? Sports Direct Gift cards are valid for 24 months from the initial purchase. If you have any balance left on the card after 24 months, the giftcard will be cancelled and you will lose your money.